An intriguing key with a fairy tale-like inscription – ‘mahogany box, golden telescope’ – was recently discovered at Brodie Castle. The Project Reveal North West team hurried to investigate. One of the team recalled a rumour that at the back of a store room lay an unassuming mahogany box, which no one had ever seen open. The box had been largely forgotten and pushed to the back of the shelf. This was just the key that might yield a result. The key neatly fitted inside the lock and inside, to our delight, we re-discovered the ‘golden telescope’ … although ‘golden’ proved to be a little misleading! 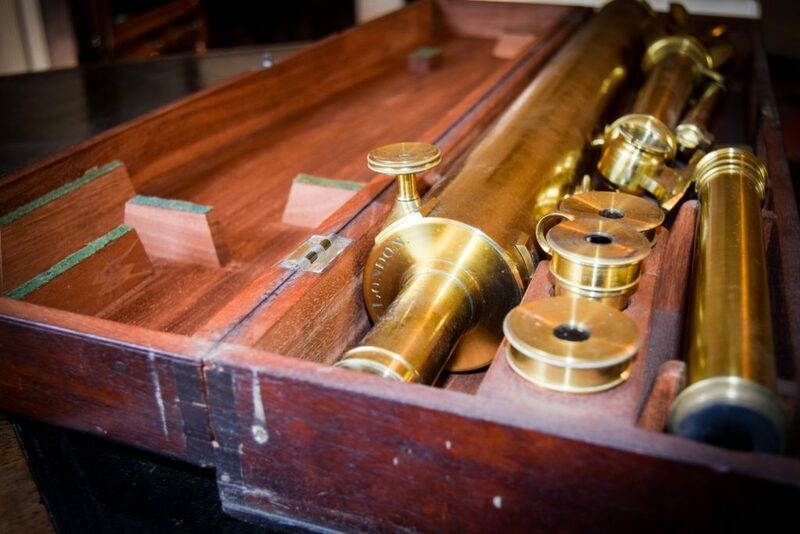 The telescope is actually made of polished brass; however, it has been beautifully constructed. The telescope has four separate detachable lenses, numbered 1, 2, 3 and 4, and sits on a foldaway tripod stand, still in its original mahogany box. It was constructed by Cary, London in the early 19th century. William Cary (1759–1825) was a nautical instrument maker, optician and telescope maker. In the Age of Enlightenment men such as William Cary catered for aspiring intellectuals who wished to discover the wonders of space. In 1781 Uranus was the first planet to be discovered by telescope, and now you too could discover the wonders of space. New technologies were opening up a world of exciting scientific discoveries. 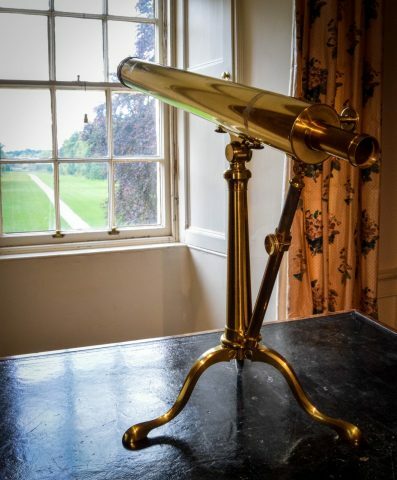 It should come as no surprise that Brodie Castle would be home to our elegant telescope. With the two impressive towers to gaze from, this would have been an ideal spot to investigate the night sky. The likelihood is that the telescope once belonged to James Brodie, 21st Brodie of Brodie (1744–1824), who was a very busy individual. He was educated at Elgin Academy and then studied at the University of St Andrews,before he unexpectedly inherited the Brodie estate. He was an amateur scientist and has been credited with the discovery of new plant species on his estate – he even had a species named in his honour, Brodiaea. James went on to become the Member of Parliament for his local constituency, as well as becoming a fellow of the Royal Society. He was in regular correspondence with many eminent scientists of his day, and it was perhaps one of these scientists that inspired him to buy his own telescope during one of his stays in London. According to an inventory of his estate made after his death, James was in possession of ‘a cabinet of minerals, a collection of botany, valued together at four pounds’, and had a personal library valued at £350, the equivalent of some £30,000 today. 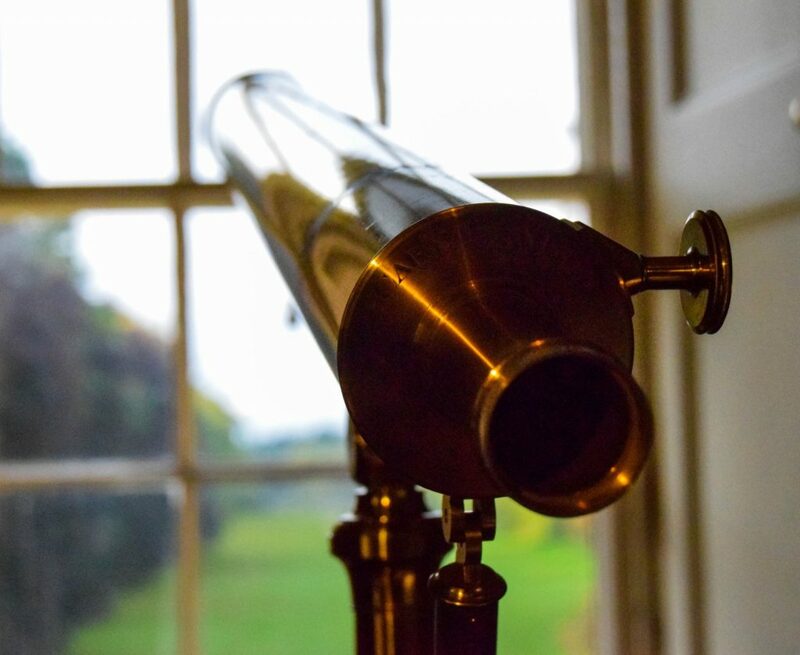 From the top of one of his towers, who knows what he may have seen for the first time through this telescope? This article is by Oliver Taylor, Inventory Officer, Project Reveal North West. Project Reveal is a multi-site digitization project of unprecedented scale. With your support, we can help the Trust manage its collections more effectively. Most important, we can help the Trust discover, better understand, and share its treasures with the world. Originally published by the National Trust for Scotland on November 3, 2017.